Workforce illness in the United States costs $576 billion annually! Planning for personal wellness is an investment in yourself. 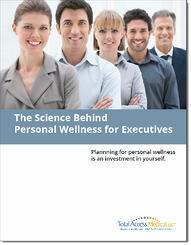 Download our Executive Wellness eBook today by completing the form and selecting Download Now! "Total Access Medical is the best health care investment anyone can make. Short story about Dr. Perkins and his staff. In November 2010, after fainting in my kitchen, I found myself in the Bryn Mawr Coronary Care Unit. Dr. Perkins was there with me every day of my hospital stay. He held daily meetings with [...]"